huds can't change crosshairs based on slot. only regular crosshairs can do that because it relies on a crosshair switcher script and scripts can't interact with huds. Now that Cow Mangler is viable is there a way to change the charge bar into a regular ammo clip counter? 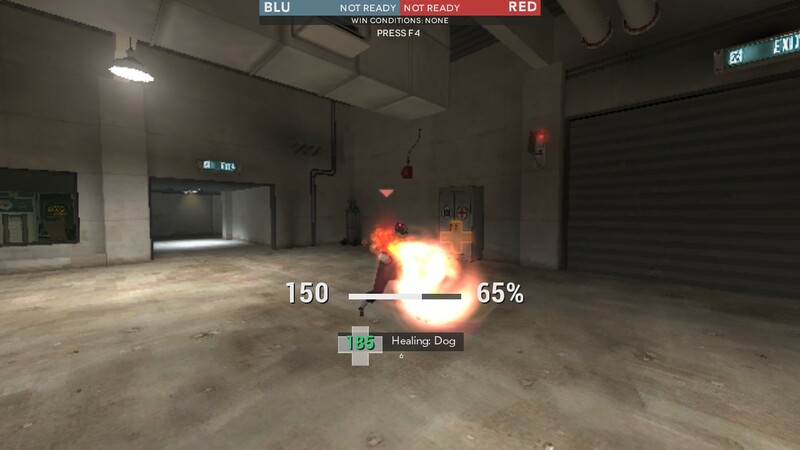 pyrotechnicNow that Cow Mangler is viable is there a way to change the charge bar into a regular ammo clip counter? Can someone please give me a name of any hud that comes with different hud-crosshairs for primary and secondary slot. A quick google search didn't make it:( huds can't change crosshairs based on slot. only regular crosshairs can do that because it relies on a crosshair switcher script and scripts can't interact with huds. 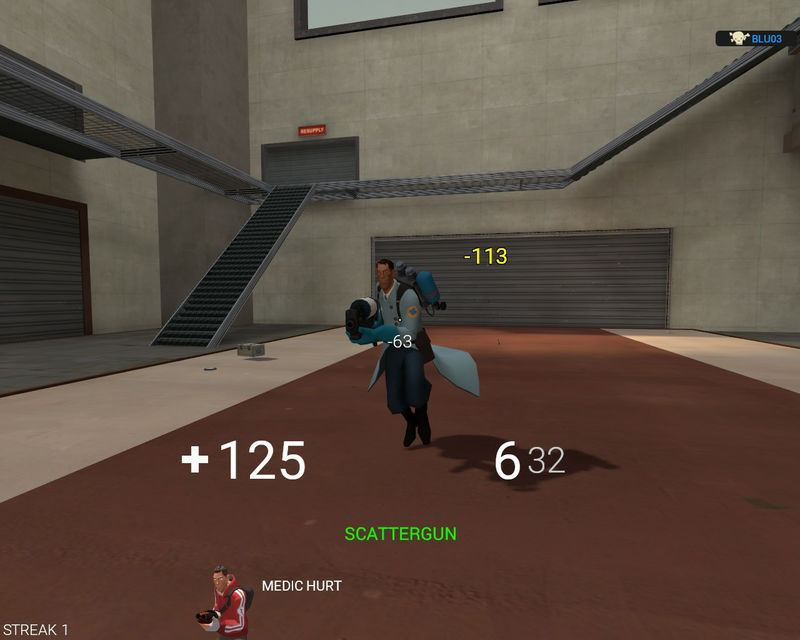 you can using the tf_weapon scripts in the script folder and you can also use the 3d playermodel, achievement tracker and one other thing to have three toggleable hud elements and for some classes like medic you can have a crosshair that only shows with your meelee or medigun. I was screwing around with my clientscheme and I screwed up a text colour. There should be white text with the black text as a shadow but it is invisible. Same with selected maps in casual and selected button text, among other things. Does anyone know what I screwed up? XenThePybroI was screwing around with my clientscheme and I screwed up a text colour. Most likely "TanLight", as that controls most of the white color in the HUD. [quote=XenThePybro]I was screwing around with my clientscheme and I screwed up a text colour. Not really a hud question, but what's the easiest way to remove the "-" from a fontfile so it only shows the numbers below the crosshair? JBNot really a hud question, but what's the easiest way to remove the "-" from a fontfile so it only shows the numbers below the crosshair? https://fontforge.github.io/ Basically just edit the glyph, remove everything from it, then go into font info and rename the font to something else, then export as a new font (if it was a .ttf, make the new one a .ttf too, and vice versa with .otf). [quote=JB]Not really a hud question, but what's the easiest way to remove the "-" from a fontfile so it only shows the numbers below the crosshair? JarateKing JBNot really a hud question, but what's the easiest way to remove the "-" from a fontfile so it only shows the numbers below the crosshair? http://i.imgur.com/3cbnNok.png https://fontforge.github.io/ Basically just edit the glyph, remove everything from it, then go into font info and rename the font to something else, then export as a new font (if it was a .ttf, make the new one a .ttf too, and vice versa with .otf). When I removed everything from it, it looked like this. I probably did something wrong somewhere. So I just went ahead and replaced the "-" glyph with the space glyph and it works as intended, thanks a lot! [quote=JarateKing][quote=JB]Not really a hud question, but what's the easiest way to remove the "-" from a fontfile so it only shows the numbers below the crosshair? When I removed everything from it, it looked like [url=http://i.imgur.com/hsi4mxn.png]this[/url]. I probably did something wrong somewhere. So I just went ahead and replaced the "-" glyph with the space glyph and it works [url=http://i.imgur.com/PLztrny.png]as intended[/url], thanks a lot! Hi, with the hud im using, whenever I'm looking at a person on my team or the other team, some of the text gets hidden and I can't see the whole number because the text is too big. Anyone know how to reduce the text size? Is it possible to edit HUD elements like the Time Left without restarting the game everytime? I know that crosshairs can be reset with hud_reloadscheme, but having to restart TF2 everytime I want to change something else I gotta restart TF2. Any commands or tricks? habadinkaHi, with the hud im using, whenever I'm looking at a person on my team or the other team, some of the text gets hidden and I can't see the whole number because the text is too big. Anyone know how to reduce the text size? my best recommendation would be to find what field you're dealing with first, then seeing if there's a "font" field inside what you're looking for. If it is a custom font, try reducing the size (ex: futura24 to futura20) and see if that works. The other thing you could try is to edit the wide and tall values so that you can see all of what you're trying to edit. pop7upIs it possible to edit HUD elements like the Time Left without restarting the game everytime? I know that crosshairs can be reset with hud_reloadscheme, but having to restart TF2 everytime I want to change something else I gotta restart TF2. Any commands or tricks? Have you tried running in windowed mode and changing the resolution after making changes to said elements? Silvvy pop7upIs it possible to edit HUD elements like the Time Left without restarting the game everytime? I know that crosshairs can be reset with hud_reloadscheme, but having to restart TF2 everytime I want to change something else I gotta restart TF2. Any commands or tricks? Maybe a change of your mat_antialias value can be a better substitute than just changing res? How does one remove the "Find a Game" dropdown, and have the buttons instead just listed? How does one remove the [url=http://s12.postimg.org/3zmrq7mvh/mainmenu.png]"Find a Game"[/url] dropdown, and have the buttons instead just listed? habadinkaHi, with the hud im using, whenever I'm looking at a person on my team or the other team, the some of the text gets hidden and I can't see the whole number. Anyone know how to reduce the text size? Depends on what hud, you're using you need to edit targetid.res and spectatorguihealth.res. instead of "Cerbetica36" it would be "Cerbetica24"
WeShallFallenHow does one remove the "Find a Game" dropdown, and have the buttons instead just listed? First up, in mainmenuoverride.res you need to edit "PlayListContainer" to be gone. "image_drawcolor"	"0 0 0 0"
"image_armedcolor" "74 74 74 255"
You need to create an entry like this for every button you want to use. 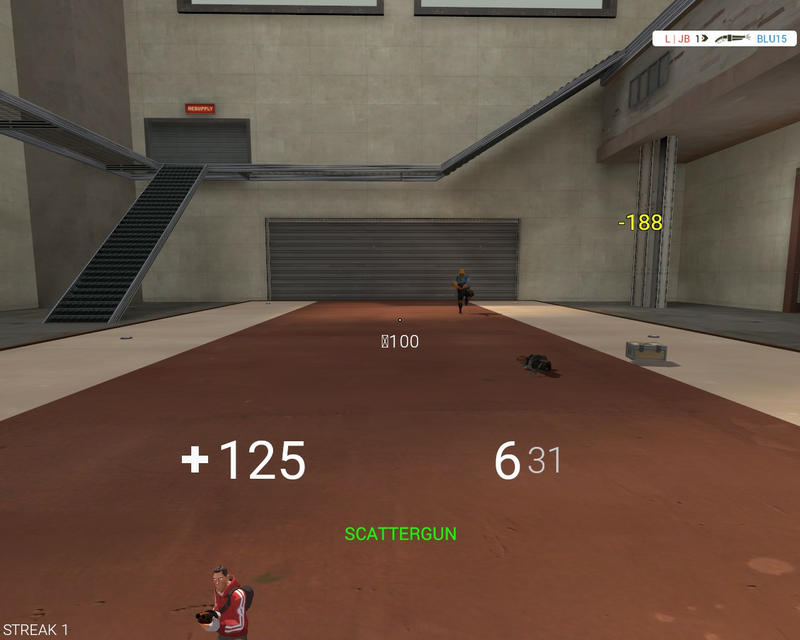 For example if you want a training button you just copy the "QuickplayButton" and rename it. Then, you just need to to something like this but rename it and change the command. How could you make the ubercharge percentage number flash green when it is fully charged? Kylo_renHow could you make the ubercharge percentage number flash green when it is fully charged? It's some field within your hudanimations file. I don't have my stuff in front of me but I want to say the field within the file is usually called event mediccharged or something similar. From there you'll just proceed to animate what you want to be animated. Koncept Silvvy pop7upIs it possible to edit HUD elements like the Time Left without restarting the game everytime? 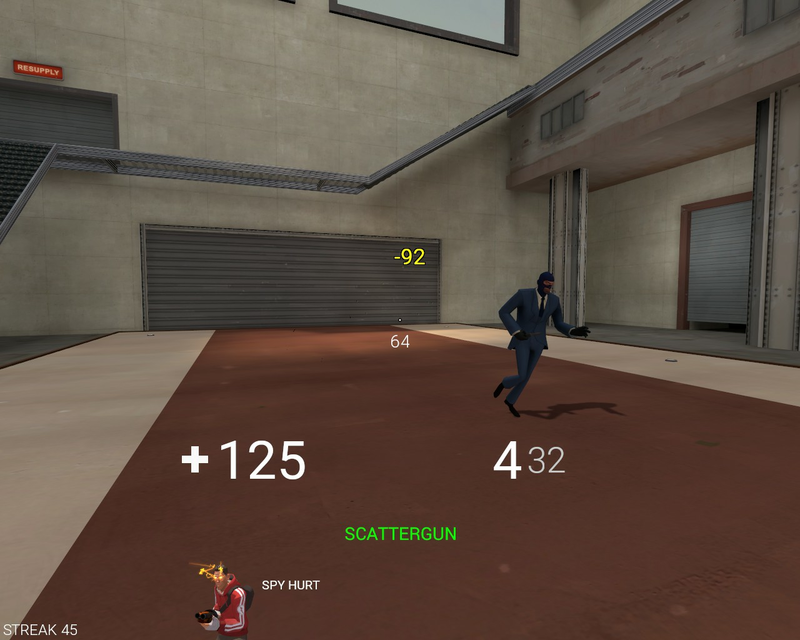 I know that crosshairs can be reset with hud_reloadscheme, but having to restart TF2 everytime I want to change something else I gotta restart TF2. Any commands or tricks? I usually do this when working on the main menu and such, it's usually kinda temperamental for me though :s Maybe a change of your mat_antialias value can be a better substitute than just changing res? I've come across an issue on one of the loading screens. I added a custom stamp_background_map.vtf in my hud to achieve a custom loading background. However, the image doesn't seem to scale correctly to the screen, even though it is the same file as background01 which scales correctly. Here's an image of the issue. The image for the background is 1024x1024. [url=http://s13.postimg.org/sqmuonqhj/halp.png]Here's an image[/url] of the issue. The image for the background is 1024x1024. Valve screwed up their game again, that's game's issue. 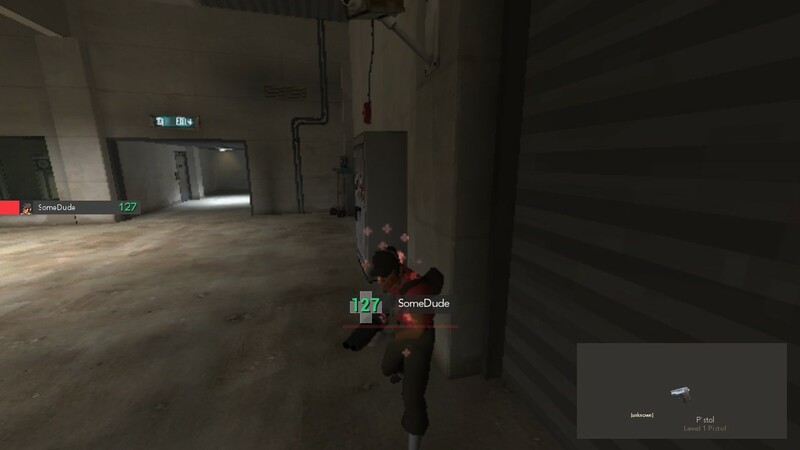 How do I edit the font in the MvM/MM/Casual chat boxes? N1ghTHow do I edit the font in the MvM/MM/Casual chat boxes? how do i edit the disgusting main menu background on this? this has prolly been asked but when in mm/casual my chat doesn't go where i moved it to in Basechat.res?